I love to make shrimp and now that Sean has a good appreciation for it as well since he has gotten older, we have it a little more frequently than we did in the past. Of course, Sean’s favorite way to have it is as fried shrimp. I don’t often make it this way because I try to stay away from doing too much frying these days, but every once in a while I do have to indulge him and make some nice, crispy fried shrimp. It is very easy to do only they only take a minute or two to make and will test better than any of the things you can buy in the grocer’s freezer that are already breaded and ready to be cooked. This recipe is sort of combination of recipes I got from Food Network and Williams-Sonoma, and you can certainly convert it into oven frying if you want to go that way instead. I also made an easy cocktail sauce to go along with it. To make the cocktail sauce, in a small bowl stir together the chili sauce or ketchup, the horseradish, lemon zest and lemon juice until blended. Season the sauce with hot sauce, if desired. Set the sauce aside. For the shrimp, heat about 2 inches of the vegetable oil in a heavy-bottomed pot, Dutch oven or large cast-iron skillet over medium heat until a deep-fry thermometer registers 350 degrees. Meanwhile, in a large bowl stir together the bread crumbs, paprika, basil, oregano, thyme garlic, salt and cayenne pepper. In a separate shallow bowl whisk together the all-purpose flour and the cornstarch. Finally, in a third shallow bowl whisk the eggs. 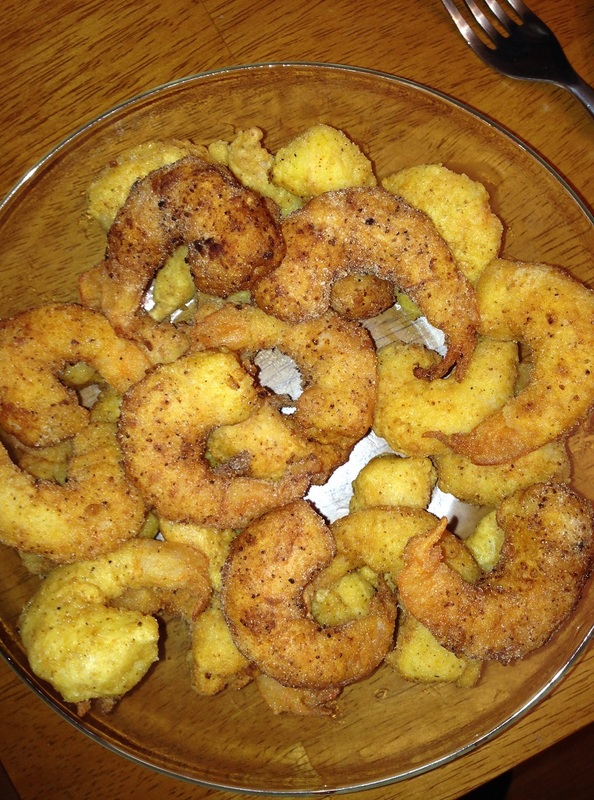 Working in batches, dredge the shrimp in the flour mixture, shaking off any excess, then sip the shrimp in the egg mixture, again shaking off any excess, and then dip the shrimp in the bread crumb mixture, turning the shrimp to form a thick crust. Fry the shrimp in the hot oil until it is lightly golden, about 1 to 2 minutes total, adjusting the heat as necessary to maintain the oil temperature. Transfer the shrimp to a paper towel-lined plate with a slotted spoon and continue frying the shrimp until it is all fried. Transfer the cocktail sauce to individual bowls for dipping and serve the shrimp. These shrimp turn out with a great coating that has really good flavor and crunch when they are done. You want to be careful not to overcook the shrimp and burn the coating or make the shrimp rubbery. They only need a minute or two at the most to get really golden brown. These are great as an appetizer for a party or to serve on a buffet just as well as you can make them for dinner. The cocktail sauce is also very easy and will stay stored in the fridge so you can use it with other fish meals or instead of regular ketchup. That’s all I have for today. Check back next time for some more great recipes. Until then, enjoy the rest of your day and enjoy your meal! I love shrimp, one of my favorite things to cook. 🙂 Thanks for sharing. It’s always one of my favorites too. Thanks for checking it out and commenting!